How do you feel about leaving your babies in the care of someone else? A friend; a relative – a stranger? Some people, through circumstances (or even through desire – not my bag but who am I to judge) will leave their baby at nursery or with a childminder from a very young age. But that’s not what I’m referring to today. 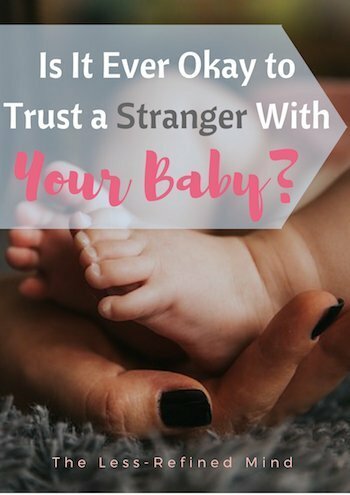 Here’s what I really want to know: is it ever okay to trust a stranger with your baby? When it comes to separation anxiety, some parents are more uptight than others *puts arm in the air* – and I wonder if perhaps that stems from some kind of trauma which makes us hyper wary. 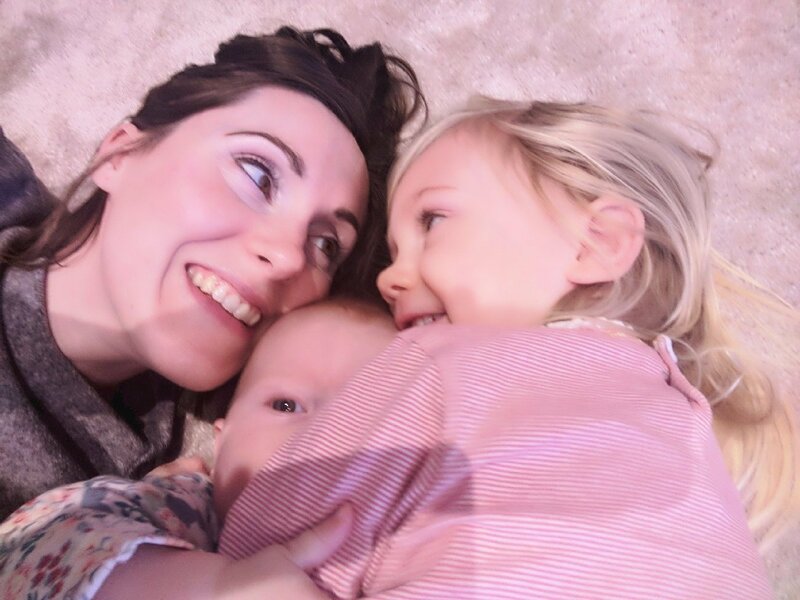 I think that was the case for me with Pixie – following her traumatic delivery I became incredibly anxious and for a long time I couldn’t have her out of my sight. But of course we get over this in time, when we’re ready. Let me set the scene. Shopping with a newborn, you’re suddenly seized with the urgent need for a wee. The disabled loo is locked and there’s nobody around from whom to obtain the key. The ladies is large enough to wheel the pram into – but not to get into a cubicle. Your sweet infant is snoozing peacefully, and the nice middle-aged lady who reminds you of your mum sees your dilemma and offers her assistance. What do you do? 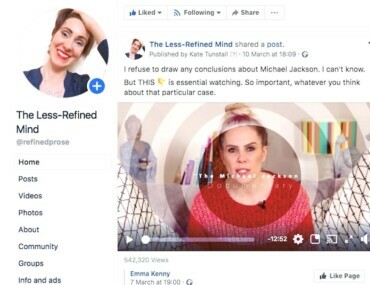 d) Allow the benevolent stranger to watch your baby for two excruciating minutes, while you play the potential consequences through your mind like a bad horror movie on loop? I went for D and I’ve never quite forgiven myself. Nothing happened – except the relief that comes from emptying one’s bladder when one’s pelvic floor ain’t what it was. Of course that was nothing – nothing – compared to the relief that came from retrieving my baby girl afterwards. 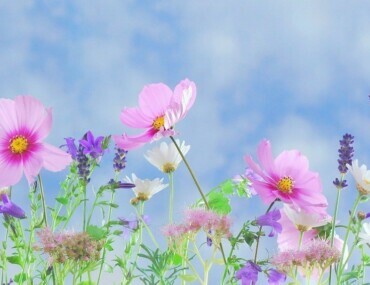 That feeling stayed with me for a long time afterwards – I can still conjure it quite vividly now. Was I wrong? Stupid? Naive? I’m still unsure, but I know I wouldn’t repeat my decision in the same circumstances: afterwards I was gripped by a sense of dread, when my imaginings turned unbidden to thoughts of Kate McCann. I’ve always believed she was a fool at best – yet I did very similar. Then there was the time I was waiting in the doctor’s surgery for an appointment and they overran so long that I needed to put a new ticket on the car. The staff suggested that I wheel Pixie into reception and leave her with them for a few minutes. I was seized by panic, but felt ridiculous to do anything other than capitulate – the English-ness in me refused to insult the kind reception staff…but – potentially – at the expense of my daughter’s safety? Of course, that was also fine. But does the formal setting make a difference? Should it? More recently I had both my girls with me and, following a doctor’s appointment, Pixie was having a great time enjoying some (spontaneous, hence ill-planned) crafts in the library. But I needed to move the car out of the time-limited free space I’d left it in, and she was not happy about it. In fairness I wasn’t either – because of the faff involved in once I’d pacified Pixie with promises we’d return! Essentially what that meant was getting trussed up again to go out into the Arctic weather, walking to the car, unloading the pushchair and paraphernalia into the car, heaving both girls into their seats and strapping them in, driving round the corner – and all to get us back out two minutes later. Fuuuun. There was about thirty minutes of the group to run, and by the time we’d got back it would be almost time to leave again. Sigh. A nice lady became aware of our predicament and offered to watch Pixie for me, who was being angelic and was totally engrossed in her gluing and sticking. What would you do?! I fell out of favour with Pixie but was able to hold my head high in taking the responsible decision – despite the cringeworthy awkwardness of basically telling the woman I didn’t trust her not to kidnap my daughter. c) Allow the kind lady to stand by the open toilet door with Elfin, crucially within eyeshot – but this also meant the toilet door was open and my poor big girl’s privacy was compromised. Again – what would you do? The woman was really very nice; couldn’t have been sweeter in fact. She even got out photos of her own young child to show me, to try to put me at ease and ‘prove’ she was genuine and trustworthy. 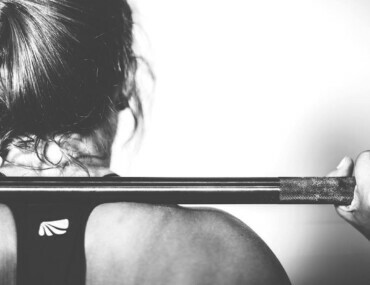 I was incredibly grateful to her – despite her enthusiastic determination ringing very quiet alarm bells…but not enough to leave my baby with her. She understood, and whilst chatting we decided that actually, we should probably notify staff that there may be somebody in trouble in the disabled loo. Thank god I never had to make that decision in the end: a worker advised that the door sometimes became stuck and on inspection it transpired that the cubicle had been empty the whole time. If these scenarios have taught me anything, it’s that we require better public toilet facilities for parents with prams, and that we must feel confident to do what we believe is right for our babies – even if it’s at the risk of offending somebody. In fairness, in each situation the ladies made clear they understood if I didn’t feel comfortable accepting their help, and some even said that though they’d be glad to assist, in my situation they’d decline the offer. Isn’t it a sad world we live in, when we have to decline help in order to ensure the safety of our babies? 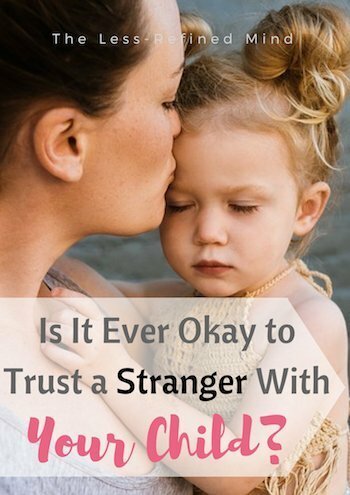 Is it ever okay to trust a stranger with your baby – and do circumstances change your answer? For example, would you respond differently to age/gender/a family; or would you react the same way to each? And would you offer help in that situation? My husband wouldn’t. He’d be only too glad to be of service, but because of the negative connotations and the default suspicion directed towards strangers – and specifically men – he would watch guiltily from the sidelines. What would you do? I’d cross my legs … but then again I have super duper anxiety and ptsd after recurrent loss so cannot be taken as a typical example! I’m amazed I let my kid (who has zero anxiety) go to her lovely fluffy hippy OFSTED outstanding nursery every day lol. It’s a really tough one, without a straight forward answer. I’m intrigued to see what other’s opinions are! Interesting post. I don’t have children, but I wouldn’t be comfortable about leaving mine with strangers if I did. That said, in some of the situations you’ve described I may be tempted to accept a kind lady’s help if I had good intuition. And I would certainly offer a mum help, without being offended if it was turned down. I once knew a couple whose behaviour I’ll never understand though. They spent a month at an Air B&B in France and became friendly with the hosts. To the extent that they decided to go to Spain for a w/e without their nine month-old daughter! She was left in the care of these hosts who admittedly sounded perfectly nice. But that’s not the point – how could any parents even dream of such a thing?? The child can’t communicate if anything’s wrong and may have traumatised from not being with her parents. Two days is a long time to leave your child with family, let alone people you’ve only known a fortnight! I think intuition is a powerful tool and agree. Yeah, I don’t get that at all. Absolutely no way on earth. I don’t think you can ever truly 100% trust anyone! But then when you need a break from the kids, who do you turn to? It’s a hard one. I didn’t want my daughter to go nursery until she was fully speaking so she could tell me if anything was wrong but I honestly needed the break. She’s very happy at nursery but I always check for signs for abuse/any changes in her behaviour. You can never be too careful. That’s true to be fair. I get it about the nursery. You hear stories, and it’s terrifying. Mind you, my daughter is talking and I don’t always trust what she says either! I let the midwives in the labour wars take George so I could get some sleep after he was born. Tbh they insisted as I was asking for everyone’s baby but that’s was probably the last time I did Tbh I’ve never had the option as he would still to this day protest that he must come with me. As for the toilet situation now I’ve been through childbirth I literally couldn’t care who saw what and I’ve always chosen to just prop the pushchair in the open doorway and pee that way. Obvs only in the confines of a ladies loo. Not a loo that would open up into a coffee shop etc as some do lol. I just would never forgive myself and I’m very crazy about not letting him out of my sight, even at the park when so many others run off and disappear into the soft play. It stems from him being so clingy I’ve never had the choice to having all the Madeline McCann and alikes on my mind and in our face on the news. I couldn’t bare not even the thought of losing him but the horrors that might happen to him. It is horrid that the world is like that but a lot of these cultivated kidnaps use women and children to win people over as we consider them more innocent and trustworthy.